"I've used this recipe for many years varying the fruits that I include. I often add apples, bananas, and/or blueberries. Though there are specific measurements in the recipe, there is no need to carefully measure each ingredient - just approximate the quantities of your favorite fruits to have a beautiful and delicious salad. I have frequently served this Christmas morning." 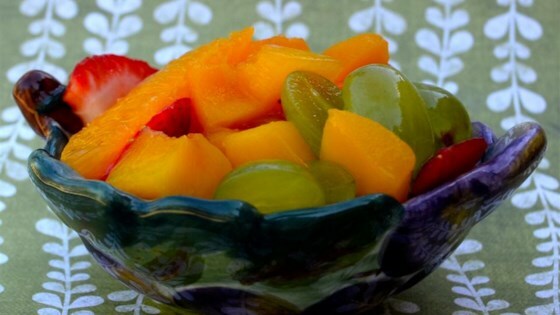 Mix grapes, strawberries, peaches, orange segments, and kiwi in a large bowl. Whisk orange juice, orange-flavored liqueur, and sugar together in a bowl until sugar dissolves; gently stir into fruit until evenly coated. Cover bowl with plastic wrap and refrigerate up to 8 hours. The number of servings is approximate. I have served this Christmas morning as well as at Easter as an accompaniment for baked ham. It is beautiful in a trifle bowl on any buffet table. This recipe was just what I was looking for. It turned out great and was a success! Thanks a bunch! !